Wilms tumor—also known as nephroblastoma—is a cancerous solid tumor that occurs in the kidneys. It can affect one or both kidneys. It is the most common type of kidney cancer found in children. Surgical resection: To remove all or part of the tumor. Developmental therapeutics: Making new treatments available for difficult-treat cancers. A child with a kidney tumor may undergo any one of these treatments or a combination of them. Our team is committed to advancing research and medicine by developing new techniques, treatment and cures for children and young adults with kidney tumors. We are home to one of the largest clinical trial programs in the country—offering our patients access to some of the most novel treatment options in the country. We are home to one of the leading childhood cancer programs in the country. Combining the latest proven technology and research with a caring, child-friendly approach, makes the Aflac Cancer and Blood Disorders Center a top choice for the treatment of kidney tumors. 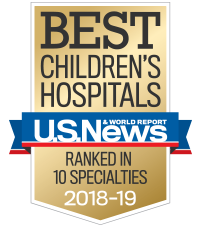 U.S. News & World Report ranks us among the top pediatric nephrology and cancer programs in the country. We offer some of the most promising new cancer treatments for children who have relapsed or who have difficult to treat cancers through our developmental therapeutics program.